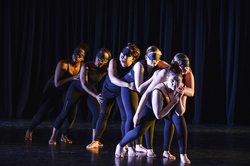 Stephen F. Austin State University's dance program will showcase senior choreographic works during its production of "Danceworks: Labyrinth … the only way out is through" at 7 p.m. April 10 in the HPE Complex Dance Studio, Room 201, on the university's campus. NACOGDOCHES, Texas - Stephen F. Austin State University's dance program will showcase senior choreographic works during its production of "Danceworks: Labyrinth … the only way out is through" at 7 p.m. April 10 in the HPE Complex Dance Studio, Room 201, on the university's campus. Additional showings are scheduled for 7 p.m. April 11 and 12, and 3 p.m. April 13. A total of 12 works will be performed and will alternate with six works being showcased during the first performance and the remaining six the next, then repeating. Admission is free for SFA students. Tickets cost $5 for non-SFA students and children; $8 for faculty, staff and senior citizens; and $10 for general admission. Tickets can be purchased at the door. The production's theme "labyrinth" plays with the idea of diversity and mystery. "We thought labyrinth was a great way to showcase the diverse choreography because you don't know what's around the corner. It's a surprise, and you have to guide your way through it and find your perception and understanding," said Heather Samuelson, dance program co-coordinator and assistant professor in SFA's Department of Kinesiology and Health Science. Danceworks serves as the capstone course for dance seniors. Samuelson explained the production teaches students a variety of skills other than choreography. For example, students learn how to cast a show, promote a performance, design lighting, select costumes and edit music. Modern and contemporary dance are the main styles that will be featured during this production, along with jazz/funk and hip-hop. One piece pays homage to the historical contributions of entertainer Josephine Baker. Before and after the production, students will be selling Bundt cakes as a fundraiser for their summer trip to Scotland, where they will perform "Tales of Neverland" during the Edinburgh Festival Fringe, the largest art festival in the world.